When I was a true Walthamstowvian, Highams Park existed as a station before Chingford and little else. Although I am sure it is now known to more local residents (who probably call it Highams Green) since the opening of Tesco last October, it still feels unlikely that it is a destination in its own right for many – and perhaps particularly so for runners from elsewhere in Waltham Forest, who are more likely to see Chingford Plain as the gateway to long cross country routes in Epping Forest and use the marshes for their shorter off road runs. 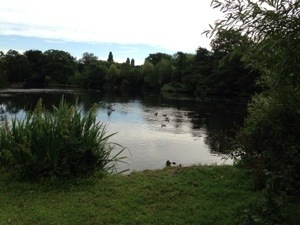 Highams Park itself, and the neighbouring lake, offer a short run combining paths, grass and forest trails, providing one of the most panoramic views of the City anywhere in Waltham Forest and varied wildlife spotting opportunities to say the least. Though I’ve more than once been startled by rats darting across my path, I’ve also seen bats when out running at dusk, and some of the largest dragonflies I’ve ever come across. A circuit of the lake or park is easily incorporated into any number of longer routes but here is a suggested c. 5km – easily reached from the station (Chingford to Liverpool Street line) so perfect for a quick after work escape for Walthamstow dwellers. Exiting the station at the clock tower side (not Tescos side) Highams Park itself can be quickly reached with a few minutes jog up Handsworth Avenue, taking a right turn it crosses with Falmouth avenue and left into Tamworth Avenue. My preferred route however , uses Vincent Road and reaches the park with a short detour through a sliver of forest which somehow remains in the middle of the relatively built up area. I always think of the path through this attractive wood as my gateway out of London – from here, barring one or two road crossings, it is actually possible to run through forest all the way up to the M25 at Epping. Most walkers through the park stick to the paths, and it was only when I started running that I went right round the perimeter and realised what I was missing. 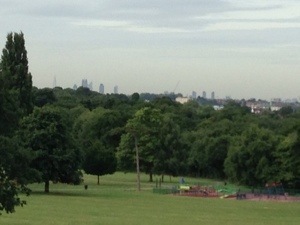 It’s not flat by any means, but a lap or two is more than rewarded by a view of the City from the top. This view, more than anything brings home the fact that we are truly On The Edge of the capital. Down along at the bottom of the park there’s more than one gateway/ stile which will lead you into the forest and onto the path which goes right around the lake. It is to me one of the most beautiful parts of Epping forest. The mud tracks stay relatively clear most of the year round, though this part of the run can feel like proper cross country at certain times. The River Ching (which gave Chingford its name) runs alongside the lake – there is a path between the lake and the river, as well as a bridge which takes you to another (often drier) path on the other side. I normally do two laps of the lake, and run both these paths. Emerge onto the road and take a right turn to set you on course back towards the station. 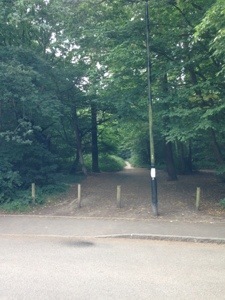 This entry was posted in Highams Park, Running on the edge and tagged highams park, running, Waltham Forest.